Flowing into the sea between the Ogmore Deeps and the famous Merthyr Mawr sand dunes to the east of Porthcawl, the mouth of the River Ogmore is rarely fished by more than a handful of local anglers, despite its tremendous potential. At low tide the river flows across the beach, creating a few deeper channels. As the tide starts to flood, these channels create natural food traps that attract fish. Most anglers fishing bait start around low water then fish the flooding tide up and the first two hours of the ebb. 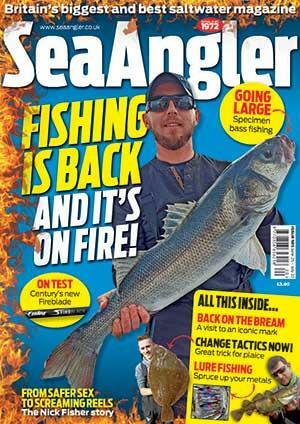 Lure fishing is generally most effective as the water depth increases and the main estuary starts to fill. Throughout the spring, summer and autumn the main target species are bass and flounder, while throughout the winter months it is mainly the flounder and codling that attract most attention. A few whiting and dabs can be caught from the beach during the winter too. Sea trout are also caught here. Sea anglers must have a migratory game fish licence to take sea trout and are only allowed to fish the estuary as far inland as the sewer bridge. Bailiffs are active in this area. Peeler crabs and ragworms are the main baits for bass and can be effective for flounder too. Bass can be taken on various types of shellfish and squid, with lugworms more effective for flounder. Ragworms are especially effective for codling. The estuary mouth is an excellent place to spin, plug or fly-fish for bass. Exit the M4 at junction 35 and take the A473 towards Bridgend. At Coychurch take the M4 towards Ewenny then turn right on to the A4524. Follow the road and the river estuary down to its mouth where you will find a large car park. Ewenny Angling Supplies, 11b Ewenny Rd, Bridgend, tel: 01656 662691. Porthcawl Angling Centre, 10 Dock St, Porthcawl, tel: 01656 772404. Ordnance Survey: : Landranger No 170 (Vale of Glamorgan, Rhondda & Porthcawl), ISBN 0319 227707.